Here is a map contains territory of Belarus, of Estonia, of Finland, of Lithuania, of Latvia, of Russia, of Ukraine. On this map capital of Latvia large city Riga free download. 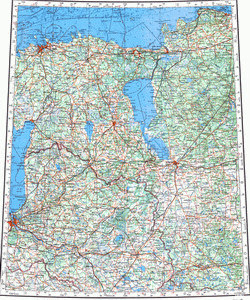 On this map capital of Estonia city Tallinn for Garmin. You can find here city Pskov for Garmin. You can find here city Tartu presented. city Sosnovyy Bor free download. city Narva for Garmin. city Petrodvorets for Garmin. You can find here city Kingisepp presented. Displayed city Kohtla-Jarve marked. You can find here city Parnu presented. On this map city Kronshtadt presented. You can find here city Luga marked. Displayed city Rezekne presented. On this map city Lomonosov download for free. You can find here city Slantsy free download. Displayed city Jekabpils for Garmin. city Valmiera free download.